Before he had begun to design interiors like the dining room at 49 Prince's Gate, Thomas Jeckyll had designed decorative metal objects, primarily fireplace implements, for the Norwich firm Barnard, Bishop & Barnards. 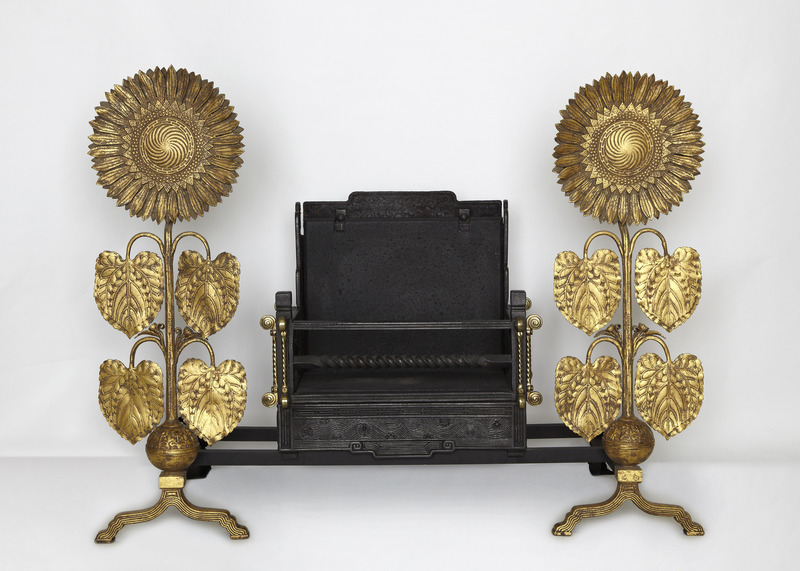 The sunflower andirons that he designed for the Peacock Room were intended to flank this cast-iron fire basket, whose Japanese-inspired designs repeat the patterns carved into the spindle shelving Jeckyll created to showcase the blue-and-white porcelain collection of his patron, Frederick R. Leyland. Thomas Jeckyll (1827-1881), "Fire-basket," in The Peacock Room, Freer Gallery of Art, Smithsonian Institution, Accession No. FSC-M-74, Item #3070, http://www.peacockroom.wayne.edu/items/show/3070 (accessed April 19, 2019).